Check out this superb new online slots game from Eyecon Gaming. Wizards allegedly have the power to carry out miraculous feats of magic, and these transformative capabilities make them much-respected figures in oral and written tradition. Perhaps the most famous wizard in literature and folklore is Merlin, wise advisor and mentor to King Arthur in Arthurian legend. Second only to Merlin may be Gandalf, the noble white wizard from J.R.R. Tolkein’s ‘Lord of the Rings’, who aids Frodo in his quest to return a magical ring to Mordor. I’m sure we would all employ our own wise white wizard if we could, to guide us in our daily quests, and perform the odd incantation to bring us a spot of health, wealth, and happiness. 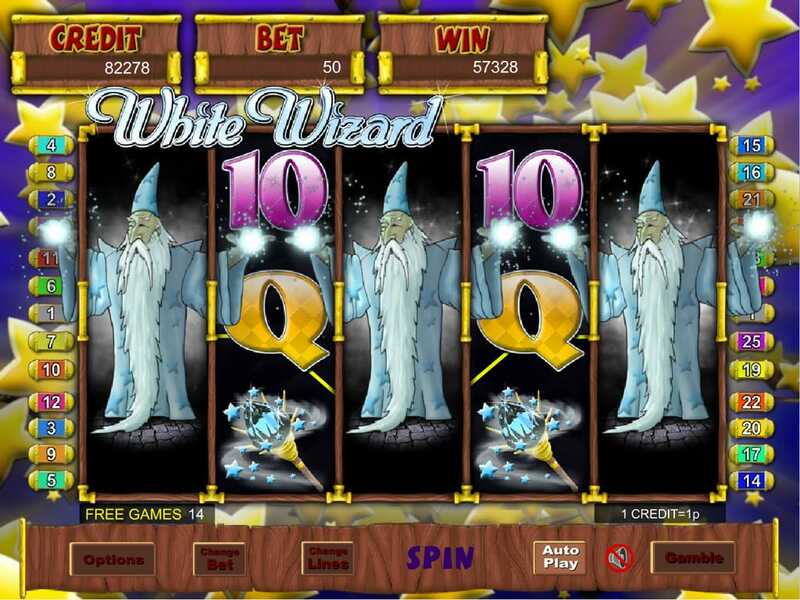 Though such wizards as Merlin and Gandalf are, sadly, the stuff of myth, The White Wizard demo slot game conjures up the legendary spirit of these two magic-makers, with its enchanting graphics, bonus features and wizardly winning opportunities. Step into a fantasy kingdom of unicorns, dragons, and ancient magic, and let the White Wizard cast his spell over you. Eyecon have been making magic in the online slots world since 1997. Their impressive history has cemented their reputation as a strong presence in the online slots world. What’s more, they move with the times and have consistently adapted themselves to stay abreast of changing trends, platforms, and customer desires in slots games. They show a savvy awareness of the contingent of slots players finding it hard to transition from traditional, land-based slot games. This is reflected in the uncluttered feel and accessible user-interface of their online games, certain to delight those who might otherwise be daunted by too many ‘bells and whistles’. Their games won’t bamboozle you with extraneous complexities but are just as vibrant and engaging to play as the work of any other leading slots developer, largely because of their lush graphics, high production values, and amusing and quirky touches. Eyecon’s refreshing, uncluttered game formats are sure, too, to appeal to seasoned online slots players, as they provide a clean interface seldom seen in the most up-to-date digital slots content. Most importantly, though, their games are fun to play, high-quality, and full of distinctive charm. If you love promo's don't forget to check out SlotsBaby today. This game White Wizard is set somewhere amongst the stars, with a spectacular background of blue sky and white star shapes, as though a spell is being cast in our direction. There are 5 reels and 3 rows, offering a maximum of 25 win lines, which can be adjusted up or down using a button below the reels. This is a great feature to have, as it opens up options to tweak the game to your liking. The reels themselves look made of solid wood, and really have the traditional feel of a physical slot machine. Realistic sound effects add to this sense, and make it particularly satisfying to spin the reels. Win lines are accompanied by an arcade-style trill, again, adding to the classic slots atmosphere. The symbols inside the reels of White Wizard are suitably magical, and amongst them are bubbling cauldrons, magic wands sparkling with blue stars, friendly-looking blue dragons, mysterious spell books bound in leather and gold, and majestic unicorns (reminding us of another top Eyecon title, Unicorn Bliss). The 9, 10, J, Q, K and A symbols all have a glossy check pattern finish in different colours, and are lovely to look at. WILDS – White Wizard WILD symbols appear on reels 1, 3 and 5, and substitute for any symbol apart from SCATTERS. Prices are also magically tripled when a Wizard appears in a win line. 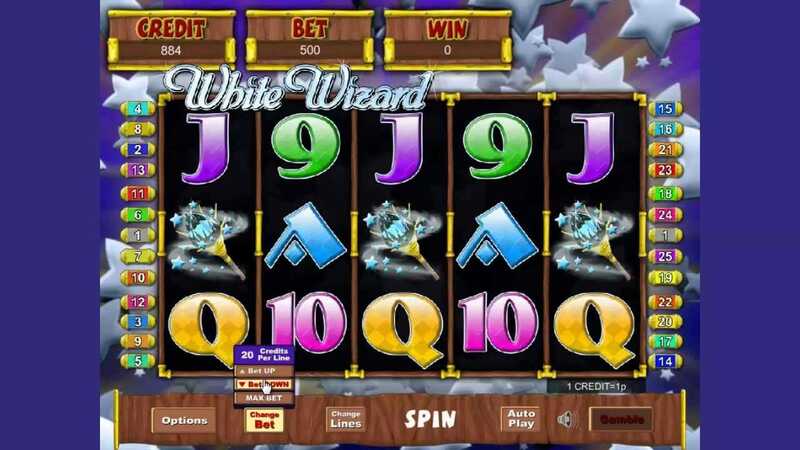 SCATTERS – depending upon the number of SCATTER symbols that appear over the reels, you can receive a certain number of Free Spins. 3 Dragon symbols results in 10 Free Spins, 4 Dragon symbols results in 15 Free Spins, and 5 symbols means 20 Free Spins. White Wizard symbols will expand to cover reels before any awarded win lines. GAMBLE – this feature gives you the chance to take away double or nothing on your last win. Select one of two choices to reveal whether you’ve been lucky, and continue until you’ve made 5 selections, your win exceeds £32,000, you choose incorrectly, or you choose to take your win. The Autoplay feature on White Wizard allows you to set the reels to operate on their own (as if by magic) for up to a total of 100 spins, allowing you to sit back like Arthur in the classic Disney film ‘The Sword in the Stone’ as he watches Merlin cast a spell for the dishes to wash themselves. In this game, you hold the magic wand when it comes to customising the type of game experience you want. It’s easy to change your bet, to anything from £0.01 to £0.50, meaning wizarding rookies can have a dabble, whereas more advanced grey and white wizards can really wield some betting power, to chase proportional payouts. <p">White Wizard is alive with small, idiosyncratic animations that make the gaming experience truly special. Dragons, for example, give a huge comical sneeze when their bonus is triggered, and Wizards wave their hands as though performing a powerful spell. There is easy access to paytables, rules and information on all the features, should the player need to ‘consult their spellbook’. This keeps you informed and in control throughout your time playing White Wizard. This smart, enchanting EyeCon offering has all the authority of a learned white wizard, and the same magic touch. The graphics are eye catching, the winning chances are plentiful, and the layout is simple, clean, and clever. Wave your wand (or computer mouse), spin the reels, and conjure up some wins! If you enjoyed White Wizard then you might also like Reel Rush.